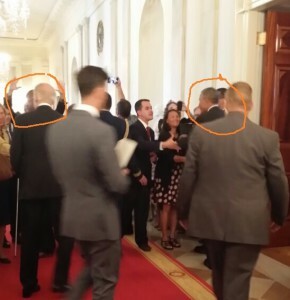 While I was at the White House ….. I was first bewildered then honored to be invited to a White House reception on July 20 to commemorate the 25th anniversary of the ADA. The invitation was completely unexpected. It arrived by email and in the sender field was “The White House”. I actually wondered for a moment whether it was spam! I couldn’t figure out HOW my name had gotten on the list — but I went, of course! It was certainly an experience to remember. Here are four of my favorite moments. 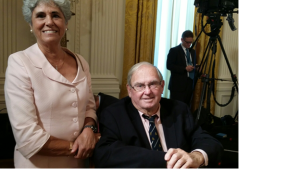 When the man in the wheelchair to whom I had just introduced myself said that he was former Senator Lowell Weicker (from Connecticut), I asked him why he was here. He said, “I wrote the ADA.” Some web research after we got home confirmed that fact: an ADA Legacy website calls him the “Father of the ADA.” He left the Senate before the significantly amended bill he had originated could be enacted into law. Senator Weicker also said that writing the ADA was one of the two things that he was most proud of in his entire Senate career. It was especially poignant to hear this from an 84 year old man in a wheelchair, clearly looking back over his life. About a half hour later, when President Obama started his remarks, he began by acknowledging the contribution that had been made by various influential ADA big wigs in the room. Sadly, he never mentioned Senator Weicker. To my ASTONISHMENT, Maria CALLED ME UP a few hours later! She said they were going to have the President write a letter – and then we had a great chat. It turns out she is the White House Disability Liaison! She confirmed that they got my name from the Acting Assistant Secretary of Labor Jennifer Sheehy, in part due to my presentations about the work disability prevention model in various DC forums, and my participation in the Stay-at-Work & Return-to-Work Policy Collaborative sponsored by DOL’s Office of Disability Employment Policy. Maria also said that they make sure to include some future-oriented people in nostalgic events like anniversaries. I was finally reassured – my invitation wasn’t a mistake! And now someone in the actual WHITE HOUSE has heard about our exciting ideas about preventing needless work disability! 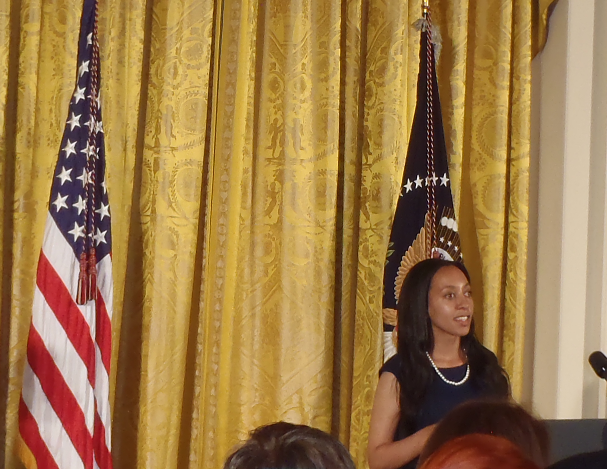 When it came time for the President to speak, he was introduced by a lively young women from Harvard Law School who is both deaf AND blind. She reminded us that much of the world has no ADA. Her African grandmother has been astonished at what has been possible for her here in the US, since no-one in Africa could imagine such a future for a child like her. She also said that at the beginning, Harvard didn’t know if and how they could accommodate her, but that they were willing to see if they could do it together. Now THAT is the attitude I wish we would hear from more employers! 4. Looking back while leaving to savor the beauty. 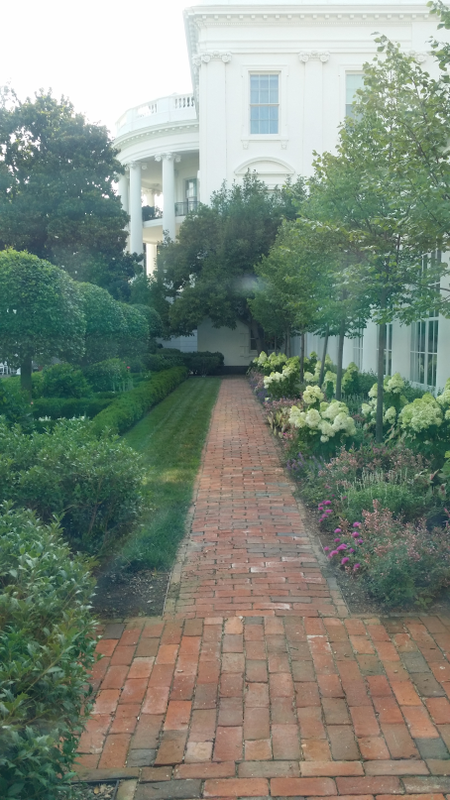 On the walk back down the long hall to the East Wing exit where we had come in, I snapped a photo of the garden, looking back towards the main White House. I never dreamed that the most memorable thing about the White House would be its classic beauty. To my eye, the style of the place evokes the noble yet practical-minded men who founded this country. It also evokes the Age of Enlightenment and the ideas about what it is possible for human beings to be and to become that undergird and sustain this fragile compact with one another that we call a nation. I feel very happy to be part of this continuing American “experiment”. This entry was posted in Events and tagged Americans with Disabilities Act on August 2, 2015 by Jennifer Christian. Between now and July 10, you have the first of three time-limited opportunities to preview and maybe influence the recommendations being made in three different policy papers that the Stay-at-Work and Return-to-Work (SAW/RTW) Policy Collaborative is producing this year. Your input (as an experienced professional in this arena) will make it more likely that their FINAL recommendations are realistic and help accomplish their intended purposes. Participation is easy. The dialogue opportunity for the FIRST SET of recommendations will remain open just a few more days — until July 10. The topic of this first paper is Expanding Access to Evidence-based, Early Intervention SAW/RTW Services and Supports, authored by David Stapleton of Mathematica. His DRAFT main recommendations have been posted on-line at a “crowdsourcing” website for public review and comment, the National Online Dialogue. To participate, simply register, read the policy recommendations, give it a thumbs up or down, or go deeper and make a substantive comment. And please forward this email to any colleagues with an interest in the topic! The SAW/RTW Policy Collaborative was created to advise the US Dept. of Labor’s Office of Disability Employment Policy (ODEP). Members are invited by the project contractor, Mathematica, after approval by ODEP. I have nominated many members all of whom have been accepted (as far as I know). If you have expertise in this arena and would like to join and actively contribute to the Collaborative, please let me know. I’m drafting the second policy paper entitled Establishing Work and Participation in Life as Accountable Health Outcomes. Towards the end of July, my major recommendations will be put into the on-line dialogue. Y’all come and give my proposals a thumbs up, thumbs down, make a suggestion or leave a comment! Third in the line-up for dialogue will be the main recommendations from the third paper entitled Job Retention/Creation for Workers Who Experience Productivity Loss by Kevin Hollenbeck from the Upjohn Institute later in the summer. Before the July 10th deadline, go to this link and provide feedback on Stapleton’s draft policy recommendations: http://TargetingEarlyIntervention.ePolicyWorks.org/ If you have any questions, please contact ePolicyWorks@dol.gov. And do remember to let other colleagues know about this SHORT-LIVED opportunity. This entry was posted in Articles, Publications, Research, Events, Policy Issues on July 7, 2015 by Jennifer Christian. Two conferences on worthy topics are going on simultaneously in Chicago this week. One is a first-time event on a topic that deserves more attention: the special workplace risks faced by workers with disabilities and their employer’s responsibilities under OSHA and the ADA. The other is a 35th annual workers’ compensation and occupational medicine event that delivers high quality programs every year. The profile of attendees at the two conferences also will probably be quite different. Which one will expand your horizons and be most useful in your career or your service to clients? Read on, learn more, and take your pick — if you can get to Chicago this week! To my knowledge, a conference on Promoting Health & Safety for Workers with Disabilities being held on June 9 in Chicago may be the first of its kind. It explores the implications of the Americans with Disabilities Act (as amended) for workplace safety and health programs. I predict this will be the bottom line: Individualized protection plans are a natural part of “reasonable accommodation” — and the need for them should be part of any template for the interactive process. The second event is the 35th Annual SEAK Conference on Workers’ Compensation and Occupational Medicine. Historically held on Cape Cod every summer, this SEAK meeting is being held in Chicago this year while the Massachusetts conference facility is being remodeled. I have attended, spoken at, and conducted all-day workshops at this annual event many times. It is an information-rich but not overly academic learning opportunity. That’s because the focus is on practical application: how to use information or how to do something important. (SEAK also offers other educational events on more specialized topics.) The speakers come from a variety of disciplines (medicine, nursing — especially case management, law — including judges, and insurance). They tend to have deep expertise in their topics, and the pace is lively. The focus is mostly on the mechanics of workers’ compensation, with less emphasis on wellness, prevention, safety, large issues of social justice, etc. If you decide to go to one of these events, please let me know which one you attended — and whether it was worth your while! This entry was posted in Events, People, Organizations & Websites on June 8, 2015 by Jennifer Christian.